Tonight, the Gilas Pilipinas is one more step to another basketball history by bringing their best of the best tonight against the undefeated Iran throughout the FIBA Asia 2013 game results. The video replay and highlights will be available to watch the toughest battle between the Gilas Pilipinas vs Iran of FIBA ASIA 2013. This is their final lap for the final championship match with Iran at MOA Arena with the support of thousands of crowd who going to witness the biggest basketball event to happen in Philippines and Asia. GAME RESULTS AND UPDATES: The Gilas Pilipinas lost to Iran in a very tough battle! Final score is 85-71. Congratulations to Gilas Pilipinas for the big heart and spirit showed to the crowd and to all the Filipinos all around the world who are watching! The moment of truth, the game will start in the few more minutes. The naturalized player Marcus Douthit can even give the decision if he can play the game tonight against Iran for the championship finals. In this very tough battle, crowd will witness again the very spirited Gilas to took the final blow tonight. We have Pingris, Aguilar, de Ocampo, Fajardo as the big men for Gilas Pilipinas who would likely step if Douthit can't play. This is the unfinished business after the Gilas and Coach Reyes momentarily celebrated their semi-final win yesterday with full of emotions in participation of thousands of crowd in MOA. August 11, the date of the FIBA Asia 2013 finals between Philippines' finest "Gilas Pilipinas" vs Iran. The Gilas promised to take the very good fight in every way they can. Their biggest assets are their hearts and spirits that should be in the game for Iran. It is not the strongest who will always emerge as victorious in every game of basketball. The heights and the appearance are not always the assessment for winning the game. This is a complete struggle between the two teams. Who has the biggest hearts will have a chance to win this game. We're still proud of you, Gilas Pilipinas of Team Philippines! BREAKING: Iran beats Gilas Pilipinas! FINAL: Iran 85, Gilas Pilipinas 71. Iran calls timeout after a Castro make reverse layup to cut Iran's lead to 12 with secs remaining in the 4th quarter. 78-67 lead for Iran, 2:39 to go. Norwood makes 2 foul shots. Gilas Pilipinas trails 14, 69-83, w/1:16 left in Q4. Haddadi throws the ball down for his 29th pt of the game! Iran up by 15, 78-63, w/2:57 left in Q4. Gilas with a stop. David with a bucket. Unsportsmanlike foul on David. Iran with FTs. Hadadi slam. 78-63 with less than 3 minutes remaining. Haddadi w/his 21st point of the game. Iran has established a 14-pt lead w/7:35 left in Q4. Timeout Gilas Pilipinas! Goal tending call on Iran. Hadadi with another putback. 74-61, Iran. 3:42 left in the fourth. Iran gets a steal and opens Q4 w/a layup. Gilas Pilipinas down by 11, 53-64. 9:23 to play in the quarter. Alapag with another 3. 24 sec shotclock vio on Iran. Alapag with FTs. Kamrany last second 3. 62-55 for Iran at the end of the third. End of Q3: Gilas 53, Iran 62. Pingris hurt, puts one in anyway. Chan gets a 3. Iran lead down to 7, 55-48. 2 minutes left in the third. Haddadi too large. Big man with another putback. Kamrany makes it a 10-point lead, 53-43. Alapag 3! Haddadi responds with a short stab. Sahakian drains freethrows. 49-41, Iran. Six minutes remaining in the third. Haddadi with two baskets. Tenorio takes back a 3. 28-23 for Iran midway through the second. Castro three ties the game at 15-all. Sohrabnejad baseline jumper ends the period with Iran ahead, 17-15. Castro heads to the charity stripe after being fouled. He makes both foul shots. Gilas Pilipinas trails by 1, 12-13. 2:01 left. FIBAAsia. Bahrami 3 pushes Iran ahead, 11-10. Gilas struggling on offense. Norwood steals the ball, gets fouled. He makes one foul shot to extend Gilas Pilipinas' lead to 3, 9-6. 4:58 left in Q1. Japeth Aguilar drops a hook over the outstretched hand of Hadadi. Gilas Pilipinas up by 2, 4-2, w/7 mins to play in Q1. Chan with a steal, draws a shooting foul. He sinks two free throws to tie the game at 2 all. 7:45 remaining in Q1. Bahrami knocks down a jumper to give Iran a 2-0 advantage w/9:26 to play in the opening quarter. Marcus Douthit not in the Gilas Pilipinas starting five. I think he can't play this time due to injury. Social networking sites like facebook and twitter here in the Philippines are flooded by the Filipino fans giving praise and proudly congratulated the Philippines' Gilas Pilipinas and to Coach Chot Reyes. We would like to thanks for following this FIBA ASIA 2013 blog updates. Here we will reveal one of the fans tweeting this one of the best praise could give to Gilas Pilipinas. If you want more tweets supporting Gilas Pilipinas after that loss, we will bring you some of these tweets. 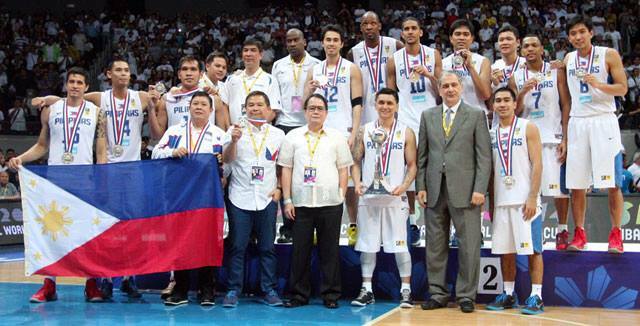 The team Iran received the gold while the Gilas Pilipinas for Silver and South Korea for Bronze. Iran, Philippines, and South Korea are the three Asian countries qualified for the FIBA Basketball World Championship next year in Madrid, Spain. 7,107 islands with 90+ million population whose hearts are beating as 1. #GilasPilipinas #PUSO"
"@gretchenho: Stii proud of #GilasPilipinas. We are going to Spain for FIBA World next year!! Congratulations! Heads up!" Proud of you all guys.#gilaspilipinas.Bravo..coach chot reserved for the championship in #Spain..
Nice try, #GilasPilipinas ! It was a good run! Congrats boys. We're all proud of you! This is a great opportunity for Gilas Pilipinas even in the second place. With the support of the crowd, nothing more to prove as one of the best teams in the country and ASIA. See you in Spain next year. Coach Chot Reyes is overwhelmed by the performance from his team for making their best with all their hearts and spirits to attain pride and honor of our Philippines country. This is one of the biggest achievement that a Filipino can make or the team can make - and Gilas Pilipinas had it for tonight.